After visiting the Green Animals Topiary Garden in Portsmouth, RI, Mom and I were ready for lunch. 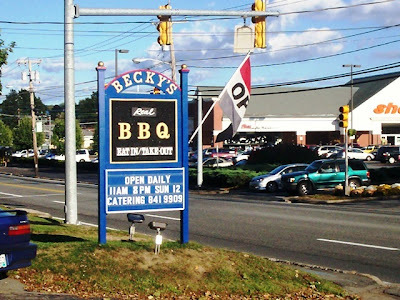 We decided to take the drive to Middletown to visit an Internet favorite - Becky's BBQ. 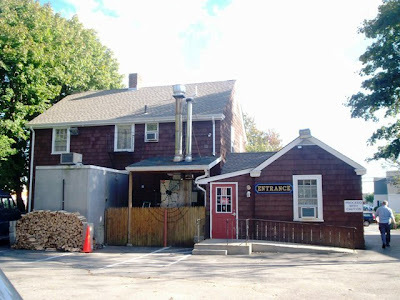 Conveniently located across from the Christmas Tree Shop plaza, Becky's resembles a home rather than a barbecue restaurant. With parking located in the back of the building, Mom and I pulled in at just around 3:45 p.m.
After paying for our meal, Mom and I took a seat at the back of the restaurant so that we could take in the full view of the place. Being at Becky's feels like you're in your grandmother's kitchen. 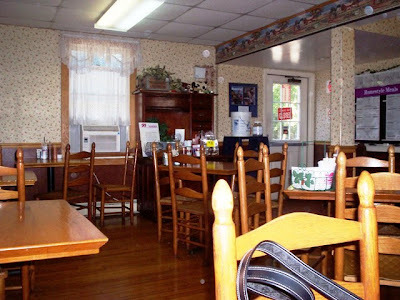 With its country decor, apple wallpaper, background music, and lace curtains, we felt very comfortable at Becky's. The smell of the barbecued meat is just intoxicating. A large hutch placed close to the door held things like small candies and various Rhode Island pamphlets and fliers. Each table was dressed with baskets that held utensils, wet naps, and napkins, and also on the table were their two main sauces - the Kansas City Sweet and the North Carolina, a vinegar/pepper based sauce. Take out menus are available on the counter, so of course, Mom grabbed one. There was also a chalk board that listed a kids' menu and the house specials. Today's listing was a Brunswick stew with cornbread and a drink for $5.99. The food did not take long to arrive, and we were pleased to see that it was served on compartment plates. A young lady in a Becky's shirt delivered the food, and about a minute later, delivered our teas. Mom's pulled pork was very moist and tender, with not a bit of fat anywhere. It was delicious, and not at all salty. She said that it was done really well, and was disappointed that the sandwich wasn't bigger as she scarfed it down so quickly. Her corn - the typical nibblet variety - was tasty. She added butter, and she said that it complimented the pulled pork nicely. Also wishing my sandwich was bigger, I thoroughly enjoyed my meal. The potato salad was surprisingly tasty. They added celery and topped it with paprika - which I love. My chicken was also very moist and tender, and I decided to add some of their Kansas City Sweet sauce to the sandwich. It gave the meal an extra kick without totally overpowering the delicious meat. Both Mom and I were afraid that the sweet tea was either going to be too sweet or too bitter, but we were both very pleased with the way it tasted. It was very cool, refreshing, and satisfying. Neither of us had ever had sweet tea, and we were glad that this was our first experience with it. I returned to the table to join Mom in waiting for our pies. We didn't have to wait long. We decided to cut both pieces in half so we could try each one. The key lime was cool and refreshing, and seemed to have a bit of a chocolaty crust. The pecan pie wasn't overly sweet (as some are) and had an unusual crackly crust that both Mom and I really enjoyed. 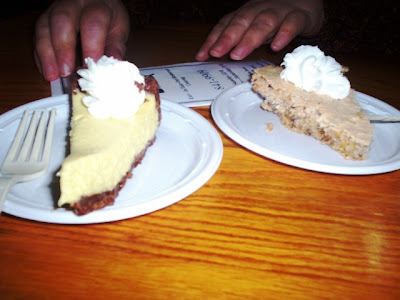 Both were topped with real whipped cream, and the pies were a great ending to a delicious meal. We left Becky's happy, satisfied, and pleased that the Internet recommendations did not let us down. Thankfully we did not have to use the restroom, because there didn't appear to be one. Perhaps it is located in the kitchen area beyond the counter. The waitstaff was very pleasant, and we even saw the young lady that brought our food return some money to a family that was mistakenly overcharged for some beverages. The only thing that we regret is that we did not leave a tip. Sometimes when we visit places that require payment before dining, we forget to leave something for the waitstaff. Perhaps it is because we're used to including the tip with the bill, but I'm sure we will make up for it next time - and there will definitely be a next time. 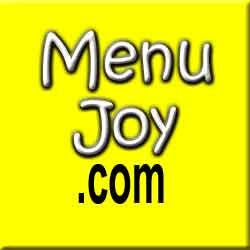 Normally I only include snippets of the menu, but since there is virtually no information about Becky's on the Internet (except five-star ratings), I decided to post the entire menu complete with prices. On the back of the menu, Becky's explains the barbecue process: "Barbecue consists of placing a large cut of meat in a closed pit and allowing it to cook indirectly by the smoke from a hardwood fire. The temperature is kept at 180 to 225 degrees, and the very slow cooking causes the connective tissues of the meat to tenderize and dissolve. We are talking about barbecuing with real hardwood, real slow, for a real long time. When that meat comes out of the pit, it doesn't need sauce because the barbecue flavor is smoked right in. The smoke ring from our cooking process creates a reddish color in our meats. This is known as a smoke ring - the sign of real barbecue." Both the pork and the beef is barbecued in Becky's hickory pit for 18 hours, and then pulled, cleaned, and lightly sauced (you can ask for meat without sauce). Becky's chicken and ribs are hand-rubbed with their own spice blend and then barbecued in the hickory pit for hours. Both the chicken and the ribs are described as "fall-off-the-bone." 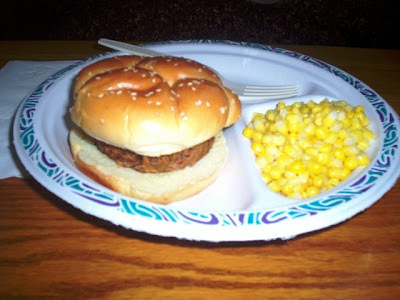 Becky's BBQ dinner specials are perfect for feeding your hungry family of four, six, or eight. The Straw House (dinner for four) includes one quart BBQ pulled pork, two pints of the sides of your choice, and four pieces of cornbread for $25.95. The Wood House (dinner for six) includes one quart of BBQ pulled pork, one pint of BBQ pulled pork, three pints of the sides of your choice, and six pieces of cornbread for $39.95. The Brick House (dinner for eight) includes two quarts of BBQ pulled pork, four pints of the sides of your choice, and eight pieces of cornbread for $52.95. Becky's BBQ is also available to cater all business luncheons, company outings, holiday functions, family events, and weddings. Mom and I actually came in behind a couple of girls that had stopped by to place an order for a party of 12. Dinner plates include rib tips ($6.99) which are subject to availability, BBQ half chicken ($7.49), BBQ pulled pork ($7.99), BBQ pulled chicken ($8.29), the 1/3 slab rib plate ($8.99), BBQ pulled beef ($9.29), and the 1/2 slab rib plate ($12.25). All dinner plates come with cornbread and your choice of two sides. You can also substitute a side in place of beverage for an additional 25 cents. Customers can also choose one of Becky's combos, where you can build your own meal with the following choices: two sides and cornbread ($2.99), BBQ pulled pork ($2.60), BBQ pulled beef ($3.25), BBQ pulled chicken ($2.75), BBQ chicken leg and thigh ($2), BBQ chicken breast ($3), and the 1/4 slab of BBQ ribs ($4.75). Add any of these meat portions to all available plates for the prices listed above. If you're looking for something lighter, there are sandwiches and sandwich plate options. BBQ sandwiches come in small, regular, and large, and are available in pulled pork ($1.99, 2.99, 3.99), chicken ($2.15, 3.25, 4.49), and beef ($2.49, 3.75, 5.25). You can also add coleslaw to your sandwich ($.20, .40, .60). 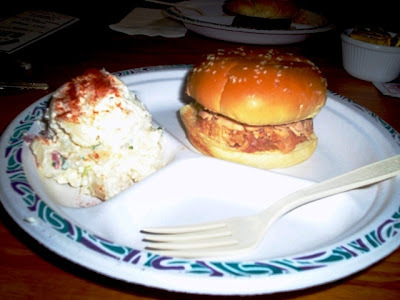 Sandwich plates include the BBQ pulled pork ($5), BBQ pulled chicken ($5.25), and the BBQ pulled beef ($5.75). All sandwich plates are served with a regular sandwich, a beverage, and one side. Lunch plates include a BBQ chicken leg and thigh ($4.75), BBQ pulled pork ($5.25), BBQ pulled chicken ($5.40), BBQ chicken breast ($5.75), BBQ pulled beef ($5.99), and the 1/4 slab BBQ ($7.25). All lunch plates are served with a beverage, cornbread, and one side. The lunch menu is served until 5 p.m., and for children under 12 and seniors, lunch is served anytime. Family style meals include the 1/2 pork ribs ($9.25), the whole slab of pork ribs ($17.99), half chicken ($4.50), whole chicken ($8.49), and a dozen wings ($3.99), which are subject to availability. You can also order the pulled meat in 1/2 pints, pints, or quarts. Pork is $4.99, $9.49, and $17.99; chicken is $5.25, $9.99, and $18.99; and beef is $6.25, $11.99, $21.99. Sides, which include Becky's three-bean bake, smashed potatoes, nibblet corn, potato salad, and cole slaw, are also available in different size containers (side $1.25, 1/2 pint $1.79, pint $3.40, and quart $6.40). You can also order a slice of cornbread for $.79. Beverages include soda or spring water for $.99, or you can try some of their delicious homemade sweet/unsweetened tea for $.99. There are free refills on the tea. For dessert, Becky's has key lime pie ($2.99), and New York cheesecake ($1.99). Listed on the chalkboard, but not on the menu, was the pecan pie ($2.50). For the kiddies, Becky's offers peanut butter and jelly on a roll for $.99, a Juicy Juice box for $.75, and whole and chocolate milk for $.99. Becky's is open from 12-8 p.m. on Sunday, and 11 a.m. to 8 p.m. Monday through Saturday.